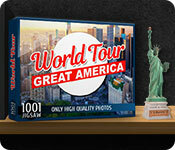 1001 Jigsaw World Tour: Great America is rated 1.3 out of 5 by 4. Rated 2 out of 5 by gkagan from Too few pieces This may be a great choice for young children, but the most pieces available (with modification) is only 238. Not worth my time. Rated 1 out of 5 by lvd04 from same old, same old I really wish this developer would read these reviews and use them to improve their games. The only thing that ever changes with these jigsaws is the pictures. I'd love to see more choices in how to approach solving the puzzles. One of my biggest complaints is how small the finished picture and the puzzle pieces are. I'd like to see the finished picture take up most of the screen. I'd also like to see more trays to sort the pieces into. I love doing jigsaws, but not these. Rated 1 out of 5 by pennmom36 from FELLOW PUZZLE GEEKS...MAKE A STATEMENT..."WE WANT MORE!" I'm a puzzle geek, I can't get enough of them, real puzzles, virtual puzzles, it doesn't matter, in fact, I've even completed the World's largest puzzle consisting of 32,000 pieces! (I had to tape four 6 ft. tables together just to fit one 8,000 piece section!) If you are a puzzle geek, please make a stand here at Big Fish, to encourage them to give us more. I have nothing against 8 Floor LTD. but they are all the same, nothing ever changes. The features are the same, the music is the same, the puzzles are basically the same, and never offered in larger sizes, and they give us NO OPTIONS whatsoever! Great puzzle games with great customizations exists, they're out there, why aren't they offered here? 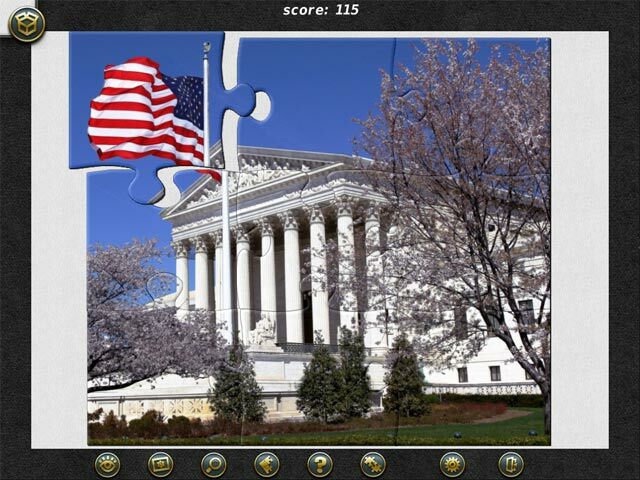 I did find a couple of puzzles here on BF, that have awesome pictures and custom features available. Yes, I'll admit, at first they seem intimidating because there are so many features to choose from, but after a few minutes of exploring the features, you soon realize that it isn't difficult, and your angst turns into excitement from all the possibilities. In 1001 Jigsaw World Tour: Great America, you can choose puzzles from 5 different boxes, the pictures are once again, mostly staged pictures, and not very appealing. You can also earn Trophies for reaching goals such as playing a certain amount of hours, joining up to a million pieces, scoring a certain amount of points, solving a puzzle without making a mistake, solving various sized puzzles, or solving a puzzle without using hints, sorting, or pocket features. There are also Top Scores and personal Best score tallies. Any of the puzzles can be modified with the number of pieces, the cut shape of the pieces and whether or not you want the pieces to rotate. There are 4 different backgrounds to choose from, pink, green, blue and grey, a box to store extra pieces until needed, a Sort option a Border only option, a Hint option and an available Magnifying glass to enlarge pieces. 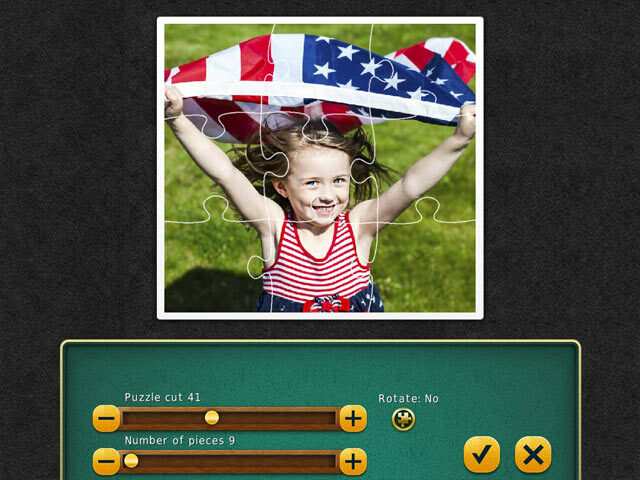 You can also ghost the image of the puzzle to the background or hang a picture in three different sizes. These are the EXACT same features offered in all puzzle games by this dev, and trust me, there are better features available! For example, in Jigsaws Galore, you can assemble a puzzle with up to 64,000 pieces! 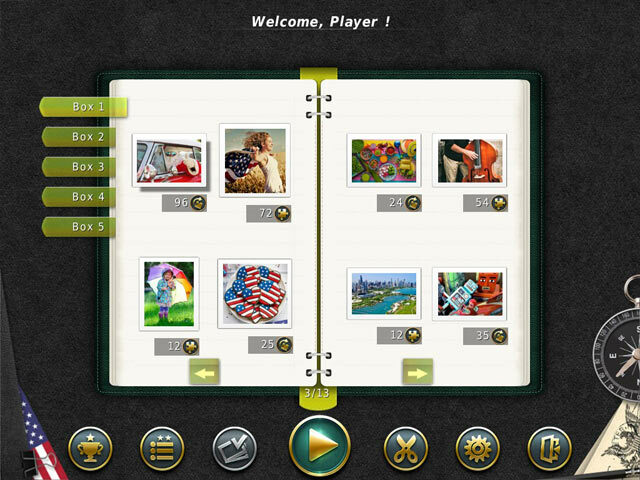 And there's so many more unique features, so I've included some bullet points of just some of the custom features available in Jigsaws Galore, features which we SHOULD expect from all puzzle games: *Each category is kept in folders, the pictures inside each folder is shown as thumbnails, choose the size of each thumbnail, create and label as many new folders as you want. *Capture your own images, or import photos, you can even crop specific sections, you can also share pictures with others who have Jigsaws Galore. *Change the size, shape or number of pieces, you can even change these features midway through a puzzle without having to restart the puzzle. *Choose the shape of the pieces, you can even add "fun" or "mystery shaped" pieces to the mixture by %, for example, add 5% of fish shaped pieces randomly into the puzzle, or 0 if you just want normal shaped pieces. *Ghost the image, AND choose the brightness of the ghosted picture, hang a picture for reference, choose the background color OR the type of material used. *Open up as many trays as you want to hold puzzle pieces, (not just a single box that can't be sorted, labeled or even easily viewed) choose the color of each tray and label the trays, right click each tray and fetch the pieces you want in each tray, such as blue pieces, or fun shaped pieces, you can choose how to arrange the pieces within each tray, line the trays along the sides, top or bottom, which can be clearly viewed and know what pieces are in which trays (sky, water, land, blue, specific shapes, however you want!) *Select how you want to sort the puzzle pieces, along the edges, in grid formation, random, you can ever de-arrange pieces, and this option is available inside each tray as well. They will even arrange by grouping the same shaped puzzle pieces together. *The toolbar can be on the top, bottom or side, and you can hide the toolbar to give you more room. *There is a zoom feature, a magnifying glass which can be set at different strengths. *Choose how thick or thin the pieces are, add shadows, turn on/off anti-aliasing (graphics realism) whether you want the outlines to disappear once the pieces snap together to show a smooth image. You can even choose the snap distance of the pieces, and choose puzzle piece rotation preference of clockwise or counterclockwise. *Auto save the puzzle at specific intervals automatically, such as every 5 minutes, never lose your progress again! *Use tools such as undo, demo, next piece finds, hints, mystery mode, auto solve, overlay pictures, zoom, or even timers. It even shows you the number of pieces in the puzzle, and how many pieces you have placed. Now do you want more?? When you know what CAN BE available, it makes a big difference doesn't it? I'm sure there are lots of gamers who don't care about all these features, and just want a relaxing and simple puzzle to while away the time, but if you do want to see more puzzles offered with these kinds of options...make a stand and let your voice be heard....WE WANT MORE!